H x W: 23.5 in. / 39.5 in. 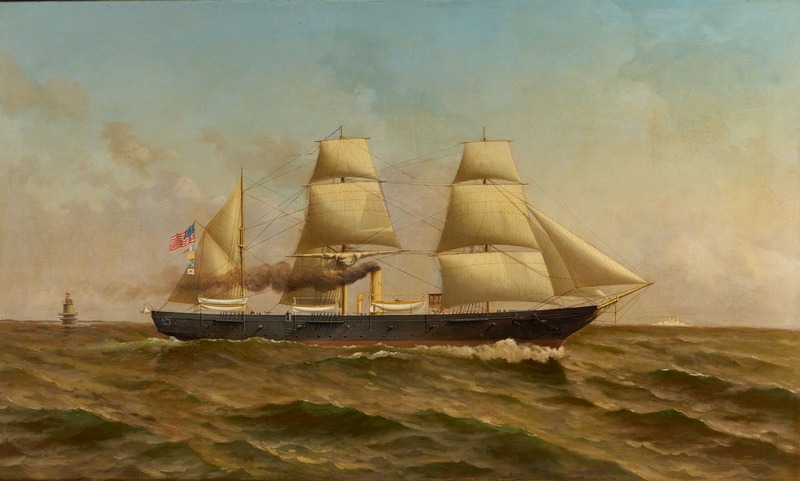 The USS Hartford, named for the capital of Connecticut, was commissioned in 1858. Flagship of Admiral David G. Farragut during the Battle of Mobile Bay in the Civil War, the Hartford symbolized the Navy’s transition from sail to steam. She is pictured underway on steam, but with sails spread. Though the ship was not decommissioned until 1926 and was not scrapped until 1956, the 1881 statue of Admiral Farragut in Washington’s Farragut Square was cast from the Hartford’s original propeller, most likely replaced during 1865 repairs following the Battle of Mobile Bay.